So writing your book has been on your mind, eh? Maybe the idea popped into your head today. Maybe it's been nudging you for the last ten years or so. You don't know what topic to write about. You don't know how to publish it. You don't know how what you're getting into. ..... and it sounds scary! "If I can help just ONE PERSON with my book, it would be worth it." You just have to decide: WHY NOW? and share the ideas you have that are not traditional. It's time to be your legacy while you live. Write that book that matters more to you than anything else (this is the real reason you haven't written it yet - it means so much to you, it frightens you). Stop worrying about how it might be received. This book is about YOU. It's your transformation time .... through your book. Once your Best Selling book is done you'll see - opportunities will start to flow in. People will start to request and seek you out. And you'll finally feel complete because that unsettledness inside you? THAT was about your book not being done and your work here on earth being incomplete. You had tried to deny it for so long. Once you see all that opens up for you, you'll wonder why you ever worried in the first place. Now, just so you know, I take your book seriously -- I spend a lot of time reading every last word and giving you thoughtful feedback. I'm most concerned with making sure your book will be effective for the purpose we discuss at the beginning of coaching. More importantly, I want you to conclude our time together confident in your book's ability to create positive change in the world, to be proud of it so you'll actually continue to use it past the best seller launch date, and to be able to stand more boldly in your own brilliance. You get a wholistic approach to growing your business. You'll learn how to set aside fears, bust through limiting beliefs, and attract clients with ease. All through the process of writing your Best Seller. We make sure your book makes sense and lines up with your business goals so that you don't end up with an expensive business card or vanity book that collects dust. We make sure it matters. Finally putting your amazing thoughts, experiences, and learnings onto paper in a way that lets you leave a proud legacy and helps change the world. Getting known for what you TRULY want to be remembered for. Having conference coordinators and event planners ask you to speak on their stages not just because you wrote a Best Seller, but because of how you told your story. Getting so filled up in your one-on-one coaching business, you have a waiting list. Allowing yourself to be fully present to what you really want and who you really are. Feeling complete and fulfilled in your purpose in this world. Finally doing that SCARY THING and allowing yourself to be potentially judged for your mistakes, experiences, thoughts and story in your book .... AND coming out triumphantly on top. Click above if you're ready to apply now. If you're ready later, I'll be excited to hear from you then. What does coaching really look like? Our time together is not just about our time on the phone. You'll have access to my online programs which I may refer you to when you need a little more explanation about something. I do that because I want our precious 1:1 time to be dedicated to things that are specific to ONLY YOU. 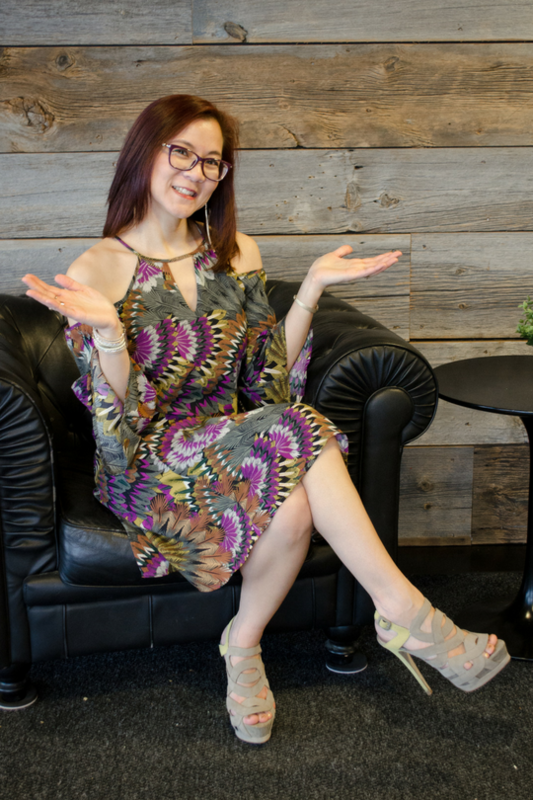 You'll have access to me via email too where I look at your landing pages, sales pages, email funnels ... whatever we are working on and I'll give you a response during my office hours, in between sessions, and even send you an online video of my comments if need be. I will read every last word of your book and help you with your stories, structure of your book, your topic, seeding and marketing suggestions, ask for more (or sometimes less) elaboration, give you suggestions and ask questions for you to answer inside your book. We'll also work on the freebie you'll give your reader so that you can capture their email and grow your list and community. In essence, it's my goal that you feel fully supported and never feel alone. to showcase you, your business, and your new Best Selling book! Are you ready to change lives, including your own? 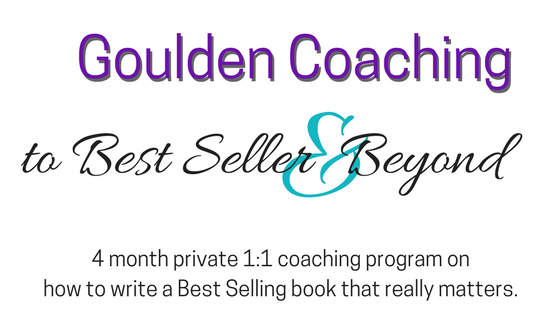 Click the button below to apply to the Goulden Coaching Program. Yes, I want a spot! The most ideal candidate for Goulden Coaching is an someone who knows they want to leave a legacy and make a bigger impact. They have a proven core signature program that people are buying but frustrated because it's not as successful as they like, and it feels like something is missing. They know that their story was meant to be shared with the world and they feel purposeful in their desire to write their book - it's urgent for them. They're committed to writing a book that truly matters. Hi, I'm Vickie Gould, multi #1 Amazon Best Selling Author and I've always loved words. I love the psychology of words too, and I've always loved learning about why we do what we do, as well. Words matter so much. They can uplift and inspire, and they can tear and break down. I want to motivate and help people to see their potential - that life that they're meant to live. So probably no surprise either that wanting to leave my mark and helping others make an impact and leave their legacy, led to books. 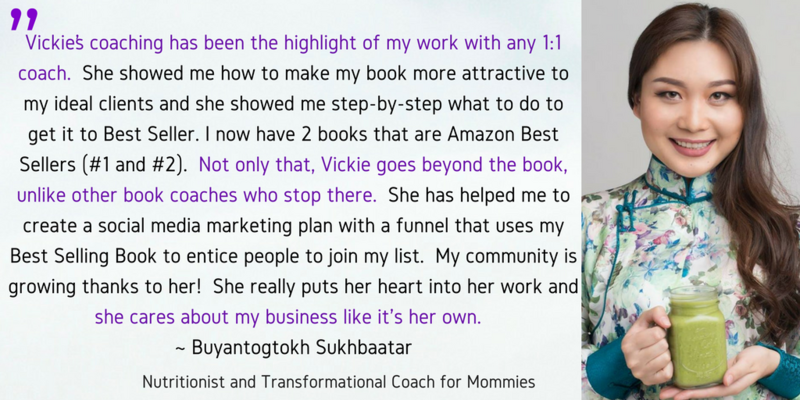 Helping entrepreneurs just like you to strategically write Amazon Short Read Lead Magnet books (these are book that are easily read in 2 hours, about 65 pages and become part of a marketing plan to funnel ideal clients to you) is where my heart is. I'm a multi #1 Amazon Best Selling Author and I've been seen on ABC, NBC, CBS, FOX and many others including telesummits and podcasts. I am a regular contributing blogger on Huffington Post. Q.How long is our time together? A.Five months. In general, the first 2 to 3 months will be used to write your book (and for me to read it) and get it to Best Seller. The remaining time will be spent creating and further implementing your social media strategy so that you can get more followers and grow your reach and impact. You will get a book funnel swipe file if you’d also like to create a marketing funnel with your book as well. 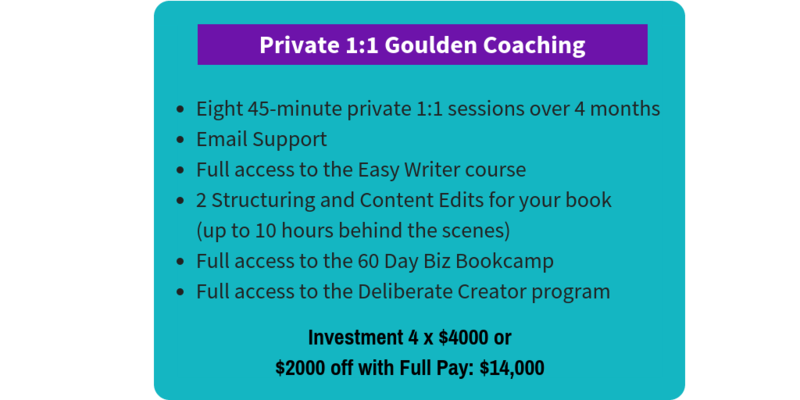 The 1:1 coaching package has 10 forty-five minute private sessions. Q.I don’t have a business tied to my book. I just want to be a Best Selling author. Does it make sense for us to work together? A.If you’re writing fiction, poetry, or a vanity book, this program is not right for you. I help people create clients out of their books. A.Editing up to 75 pages is included in the Real Deal coaching program. Q.Who is doing the publishing of my book? A.I coach my clients to self-publish their book. You will have much more flexibility this way, get your book published faster and retain the maximum amount of profits. Q.How long will it take to get to Best Seller? 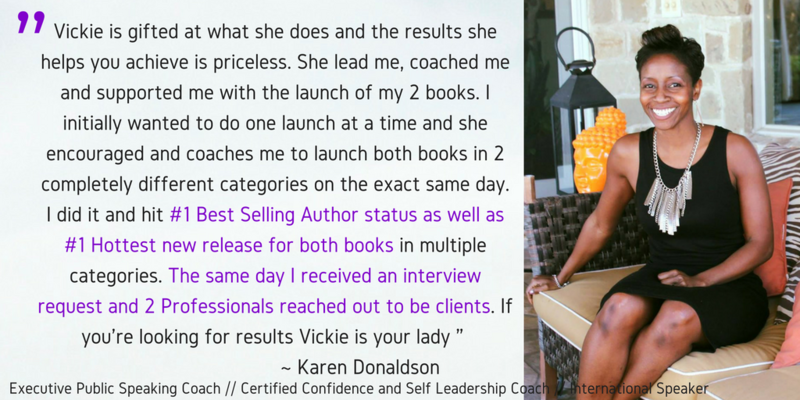 A.In general, you’ll be a Best Seller in 3 months of beginning our coaching – this is usually about 2-4 weeks after your book is completely done. You will hit Best Seller within 24-48 hours of the date you choose to launch/release your book. 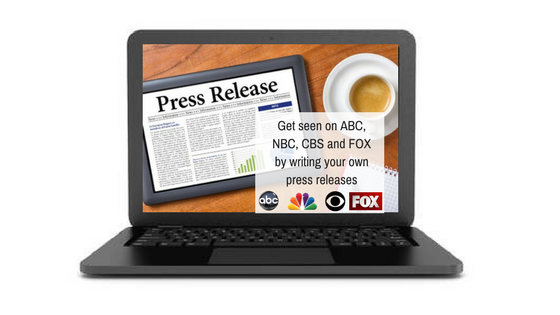 You will be “as seen on” ABC, NBC, CBS and FOX soon after your Best Seller launch. Q.Is creating my cover included? A.Creating a cover is very personal. This is why it’s up to you to find someone who can make a cover that reflects you. I have a great recommendation on fiverr. Q.Can you help me sell enough books to earn passive income? That’s all I want. 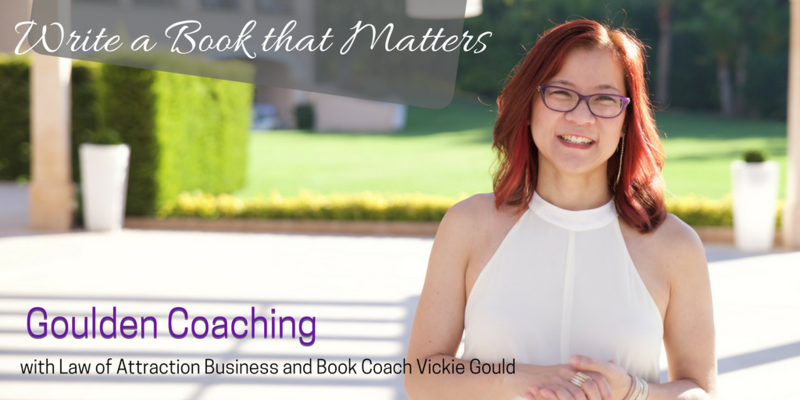 A.My coaching is not about selling books for passive income. You will make the most income from the upsell after your book. You will help the reader see this as their next step, with my help. You are, first and foremost, an entrepreneur and you will make far more money through getting clients from your books than the royalties that Amazon gives you. Q.How is your online program different from your 1:1 coaching? 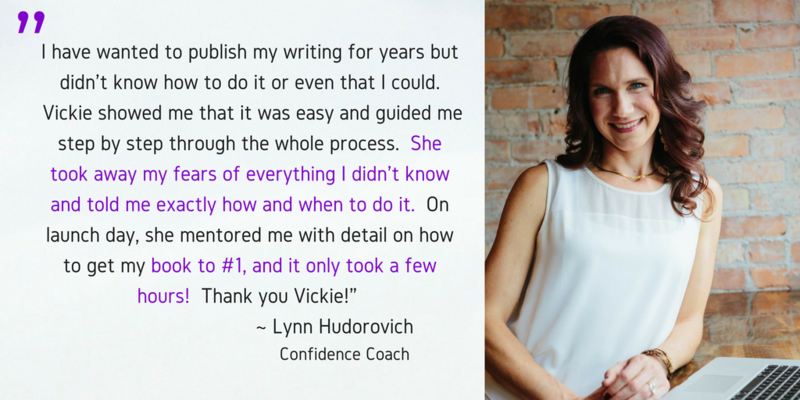 A.You will get complete access to my online program, Easy Writer, included with 1:1 coaching. One big difference is the Easy Writer online program is a purely online course with no live coaching. The promise of my online course is to create a business book that becomes a Best Seller. 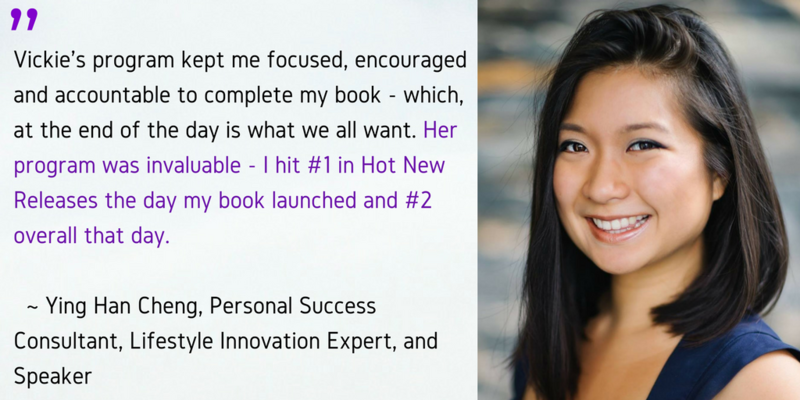 Working with me 1:1 will allow us to not just work on your book and Best Seller launch, but also have me read it and give you personalized feedback. We also work on growing your following while you write your book. By the time we’re done, you’ll know how to be masterful at storytelling, how to write engaging emails, and social media posts and know how to create a year’s worth of social media content including videos and courses if you’d like. Q.Is there a payment plan? A.Yes, definitely. For the convenience of my clients who want a payment plan, the payment is $2400 per month for 5 months. If you pay in full, you will receive a $2000 discount and get my 1:1 coaching for just $10,000. Q.What kinds of books do you help people with? 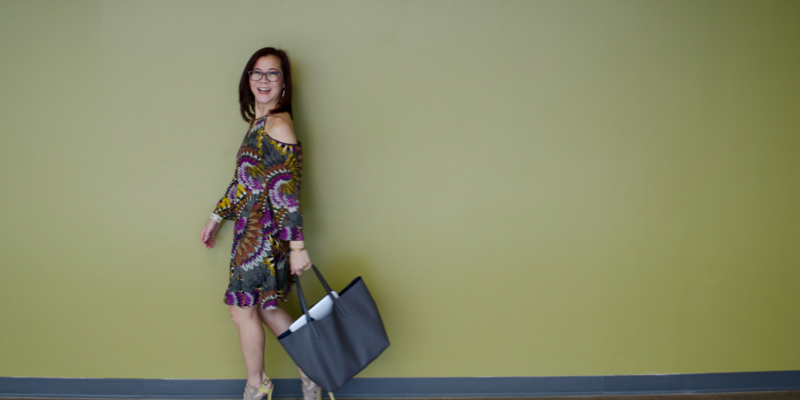 A.In general, the books best suited to my program are books that are tied to a business because the really revenue from books comes from converting that reader into a client who buys one of your products or high end packages. It’s critical that you have an upsell for your reader. Q.I'd love to work with you but do you have a smaller package? A.If you’re asking because of the investment, I would refer you to my Easy Writer Guaranteed Amazon Best Seller program at www.vickiegould.com/amazon-group. If you’re asking because you don’t think it will take 5 months, in my experience, unless you just want to only complete the book and get to Best Seller, and you don’t care about the rest, we will need that time to grow your following, create your posts and videos, potentially even create a course from your book together. Q.How can you guarantee the Best Seller title? A.I have a tried and true launch sequence that I will share with you when we work together. It’s never failed since implementing it. Q.Can I talk to someone to see if this program is really for me? A.Absolutely! Just click the button below and apply to talk to me. I’d be happy to help you decide if this program is a good fit.